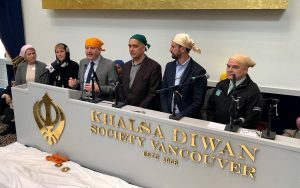 VANCOUVER’S Khalsa Diwan Society on Sunday held the Grand Opening of its Ross Street Gurdwara following restoration after fire damage as well as renovation and building extension work at Ross Street Gurdwara. The Society’s President Malkiat Singh Dhami, former president Jarnail Singh Bhandal and other office-bearers welcomed devotees as well as a host of dignitaries that included Defence Minister Harjit Sajjan and MPs Sukh Dhaliwal and Randeep Sarai (see first photo), and Vancouver Mayor Kennedy Stewart and Vancouver City Councillors (see second photo). Langar will be served all day. The Society, with over 10,000 members, is a pioneer Sikh society that was formed on July 22, 1906. It has played a major role in the social and economic development of B.C. for over a century. It is a volunteer driven organization that provides religious and social services to the residents of Greater Vancouver.